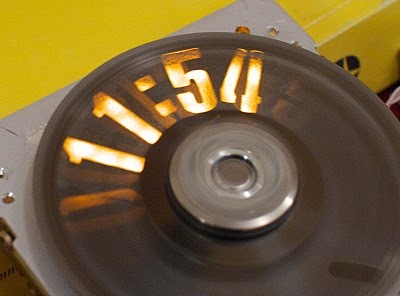 Strobeshnik is a somewhat different twist on the hard drive clocks we’ve seen in the past. Though still technically using a POV effect, the Strobeshnik displays the numerals instead of a line. By altering strobe timing of an LED behind a platter with the numbers cut into it, he can display whichever number he wants. We think this is pretty slick. Niiiiice. I want one now. Now that’s quite nice. Very cool effect. not epileptic friendly. Though the sheer speed at which the “strobe” is done may be fast enough to not cause seizures. Interesting take on POV displays. I have to wonder if it’s safe to spin a platter at speed after cutting 75% of it out. @M4CGYV3R, that would depend on what the platter is made of and how the cuts were made. I would definitely want to re balance them before spinning them up though. I wonder how tough they were to cut. It’d be interesting to see alphanumeric characters, but that would require smaller, more precise cuts. Very cool. You think that he would have tried to cut the numbers in such a way that would minimize the amount of balancing that need to be done. I.e. put the – and the : on opposite sides of the platter. He might have had better luck salvaging a newer drive, the kind with the platter made of glass, not aluminum. All he would have had to do would be to etch through the thin magnetic media layer, and the glass would remain fully intact. Regardless, that is the coolest thing I’ve seen on this site in some time! Well done! Why not replace the platter with some other material… like heavy card stock? I do agree that an Al platter (as used in this hack) seems to work just fine (and is more-cool than heavy card stock)! Regarding platter stability and balancing, things may depend on what the resonant frequency of the wobble is. If that resonant frequency is sufficiently low, the system will experience less vibration at higher RPMs. At that point, the yield strength of the cut material will be more of a concern. If you plan out where you want the numbers in advance, in a CAD program that supports that kind of analysis, you could simply stick it in a badass laser cutter and have it done quite accurately. Upon first sight, I thought he just cut pixels at various distances from the center of the disk, and used that to construct the numbers. That way, you could basically display any picture you wanted, only in a very low resolution. A possible problem would be that neighboring pixels might show up faintly because of reflection behind the disk, but maybe that could be solved by introducing barriers below the disk, so that the distance between the barriers would be more than the distance between the pixels. But then you’d probably get a new problem, because the barriers would cause dead spots in the picture, where you can’t display anything. Maybe you could attach the barriers to the disk, but that in turn would create a whole lot of new problems. As for the balancing of the used disk; maybe you could write a script to figure out the optimal distribution and spacing of the digits, to both maximize the shortest distance between the cuts, while maintaining the center of gravity of the disk. While the optimal solution might be an NP-complete problem, I think it would be possible to find a satisfactory sub-optimal solution with a fairly simple algorithm. The distribution and non-uniform spacing of the disk could easily be accounted for in the software. i forgot: I think harddisk spindle motor are meant to be run with back-EMF sensing, which shouldn’t be all that hard to implement. Some motors do need to be drive with 3 half bridges though, but at such low currents, that doesn’t have to be a huge problem. Awesome. Should I ever get to build mine, I’ll make sure it’s a hybrid version with “analog” (slit) and “digital” (number) plates that can be changed. Just add some RGB LEDs to this design. That’s clever, I would not immediately think of using absorbing rather than reflecting or magnetic. Hi, thanks for featuring Strobeshnik! Re: the balance. It would be pretty clever to rearrange the digits indeed, but I didn’t think of that in advance. It’s not that much of a problem however. People tend to attribute the noise in the video to poor balancing, but what you hear is due to primitive PWM-less motor control. The platter works a little bit like a speaker cone and switching of coils at short duty cycles produces that buzzing noise. I’d try spin coating one in PCB photoresist then expose with a mask on both sides. when done develop as normal then immerse platter in a suitable etchant (note, might need to be aggressive such as HCI, careful!) and remove, rinse then clean off resist with suitable solvent. @bothersaidpooh: I tried tried chemical etching from both sides actually. It worked much better than single-sided, but still too much was lost. Galvanic etching is much more directed, until about halfway deep the edges still look perfectly sharp and it’s only later they start to deteriorate. Probably a better combo of electrolyte concentration and current could be found for a better result. Re: glass platters: you can’t etch the outer coatings, they can only be grinded away. This is incredibly beautiful. Can’t wait to see what you do next.